La limonaia was born as a holiday home for the owner. A writer who lives between Italy and England where he often goes to set his novels. 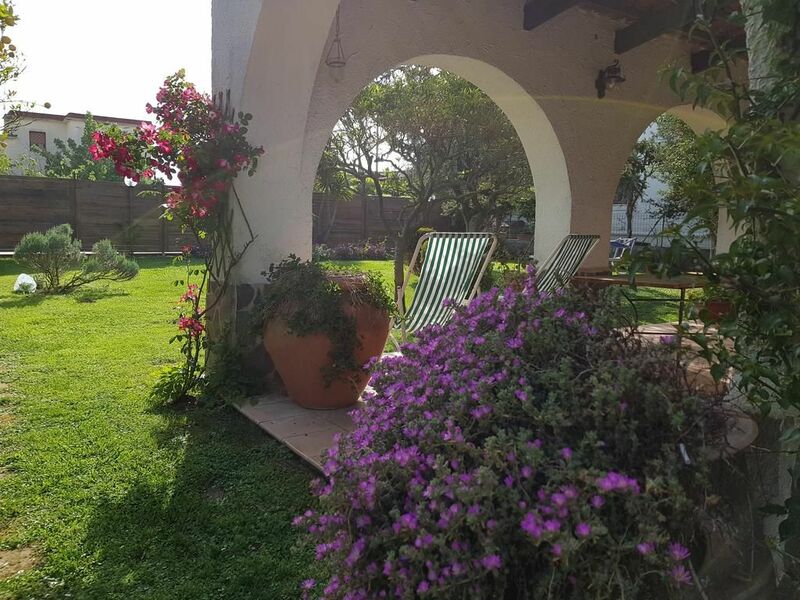 The property is surrounded by greenery in a quiet environment surrounded by a large garden with lawn, lavender bushes and lemon trees. The villa, ideal for five guests, consists of three bedrooms, kitchen, living room and two bathrooms with both indoor and outdoor shower. There is also a large patio to shelter from the sun and organize meat or fish barbecues. Appliances, Wifi, soaps and linens are included at no extra cost. For winter stays there is heating and the possibility of using the fireplace. Parking is free. La Limonaia is 30 km from Naples and the main museums and cultural attractions. Just over twenty minutes to get to Baia, Pozzuoli and the embarkations for the islands. Near Castel Volturno there is the Lago Patria, the Oasis of the Variconi and the Eco Park of the Mediterranean. Easy to reach the motorways to Caserta and Naples. The equipped beaches of Pinetamare are five minutes by car. Golf courses and riding stables are just under 3 km away. In the area there are numerous dairies where you can taste the typical buffalo mozzarella and pizzerias where pizza margherita stands out. Shopping centers, pharmacies and pubs are at your fingertips. Even the hospital is very close, but, of course, we hope you never need it ..
Abbiamo soggiornato alla Limonaia solo una notte ma ci è dispiaciuto così tanto andar via che abbiamo deciso di tornarci quanto prima per godere più a lungo di questo angolo di paradiso! La casa è ampia, arredata con gusto, accogliente, comoda e ben organizzata e il giardino è ancora più bello che in foto. Il nostro host Vincenzo poi è una persona veramente gentile e molto disponibile. Insomma questa è proprio la casa giusta per rilassarsi dopo una giornata di mare o turismo. La Limonaia is just a few minutes from the shores of Pinetamare. But it is strategically optimal to quickly reach other places of interest such as Gaeta, Sperlonga, Pozzuoli where you can embark for the islands of Ischia and Procida. With the ring road it is easy to reach Pompei, Sorrento and Amalfi in just over an hour. The internal area is also renowned for the vast breeding farms of Bufale from which milk is obtained for the famous mozzarella that can be purchased in many dairies in the area. In Pozzuoli it is possible to buy fresh fish just downloaded by the fishermen. The pizza is excellent and can be enjoyed without necessarily going to Naples.